Why Choose Hawaii for Online Higher Education? In the future more employers will require employees to have a college degree. A report by the Georgetown Center on Education and the Workforce projects that 70% of jobs will require a college degree by 2020. The Hawaii State Department of Labor and Industrial Relations projects the creation of 45,540 new jobs by 2026. Three quarters of those projected new jobs will not require a college degree, but the 23% of jobs that do will offer higher pay. Online colleges in Hawaii offer students, including full-time working professionals and parents, the chance to compete in a changing and competitive job market. Keep reading to find resources, information on important deadlines, and learn about the most affordable online colleges in the Aloha State. Online colleges in Hawaii and nationwide continue to grow in popularity every year. For students with work or family commitments, online classes allow flexibility while earning a college education. In the state of Hawaii, students can find a total of 20 online programs. Some 2,844 undergraduates and 698 graduate students take classes exclusively online in Hawaii, and 83 students living internationally take advantage of the wide breadth of online programs offered in Hawaii, according to the 2016 IPEDS data listed below. Generally, in-state tuition almost always costs less than out-of-state tuition; however, online students who live in another state may receive a tuition break. To receive in-state tuition students must provide proof that they have lived in Hawaii for at least one year prior to the beginning of the semester. Students who intend to make Hawaii their permanent home may be eligible for in-state tuition with the appropriate documentation. The state also gives in-state tuition to military personnel, employees of the university system, and Native Hawaiians. Furthermore, through the National Student Exchange, Western Undergraduate Exchange, and Western Interstate Commission of Higher Education students in designated states can establish residency for in-state tuition in Hawaii. Students living on Pacific islands that do not have a bachelor’s-granting institution can also gain residency status. Below find more information about in-state and out-of-state tuition. Online programs in Hawaii offer competitive tuition rates when compared to the national average. The national average, as of 2018-2019, for in-state residents at public colleges runs $10,230 and $26,290 for out-of-state students, according to the College Board. Online students almost always save money since they do not pay for housing, parking, transportation, and other fees which traditional students incur. Keep reading to find out more about online tuition for in-state public, private, and two-year online colleges in Hawaii. Out-of-state students planning to attend college in Hawaii have pros and cons to consider. Students from states within the Western Interstate Commission for Higher Education, or WICHE, can attend college in Hawaii for a discount. Under the WICHE undergraduate and graduate students have a cap on the amount of out-of-state tuition they have to pay. To find out more, keep reading. Hawaii, a member of WICHE, provides students who live in member states the opportunity to receive tuition breaks. Hawaii participates in three student exchange programs: the Western Undergraduate Exchange, the Professional Student Exchange Program, and the Western Regional Graduate Program. Fourteen states have membership in WICHE, including Alaska, California, Colorado, Hawaii, Idaho, Montana, Nevada, New Mexico, North Dakota, Oregon, South Dakota, Utah, Washington, Wyoming, the Commonwealth of the Northern Mariana Islands, and Guam. Per the WICHE agreement, out-of-state undergraduate students who earn online degrees in Hawaii, pay no higher than 150% of in-state tuition. Graduate students can study out-of-state and receive in-state tuition. To find the best online programs in Hawaii takes time and patience. Luckily, we have culled all of the online programs in Hawaii using a methodology backed by data provided by the Department of Education and the Integrated Postsecondary Education Data System. Our methodology examines numerous factors including accreditation, the breadth of programs, tuition prices, and graduation rates. 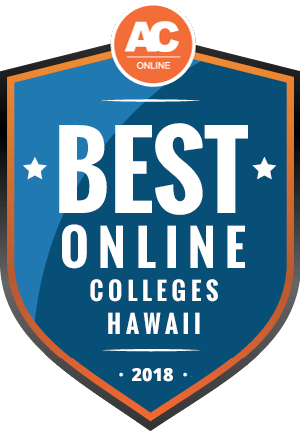 Keep reading to learn more about the best online colleges in Hawaii. Doing college research presents a daunting task. To make it easier, we have consolidated frequently asked questions about online programs in Hawaii. Below you can find answers to your questions about tuition, start dates, FAFSA forms, and transfer credits. Do online credits cost more or less in Hawaii? The cost of online tuition varies by college. Online tuition, when compared to traditional classes, may not always offer cheaper rates. However, under the Western Undergraduate Exchange, online students qualify for reduced out-state-tuition in Hawaii. At the University of Hawaii at Manoa residents attending college during the 2018-2019 school year paid $16,632 for tuition and fees, whereas non-residents paid $33,120. However, under the WICHE agreement, out-of-state undergraduates cannot pay more than 150% of the in-state tuition, if they live in a qualifying state. Generally online and on-campus tuition remains the same. For example, online students at UH Manoa pay the same amount as traditional students. Non-resident students taking online classes do not pay more than resident students, the same rule applies for Chaminade University, a private institution, where online tuition runs $18,000 for nonresidents and residents. Tuition for traditional undergraduates runs $25,374 for the 2018-2019 academic year. Which Hawaii schools accept the most transfer credits? In Hawaii, much like nationwide, students have the most success transferring credits from one regionally accredited institution to another. Students will have the easiest time transferring credits from one Hawaii college to another Hawaii college. For example, Chaminade University accepts all credits from University of Hawaii community colleges. Grades also matter when it comes to transferring credits. Students have the best luck transferring courses which have a grade of “C” or better. Students should also consider when they took the classes. Hawaii Pacific University does not place an expiration date on classes; however, Chaminade University typically only accepts classes completed no more than 10 years ago. Many online colleges in Hawaii offer students the option to see how many credits will transfer prior to enrolling. Potential transfer students can, prior to applying, check to see how their credits will transfer by using the University of Hawaii’s List Mode search. At Chaminade University, applicants can request a transfer credit evaluation before applying. The amount of transfer credits accepted depends on the college. Chaminade University accepts up to 90 credits toward a bachelor’s degree. Hawaii Pacific University requires that students complete their last 30 credits at the school. Will any online colleges in Hawaii accept a GED? A student with a GED typically goes first to community college, where they earn college credit, and then transfers to a bachelor’s program at a four-year school. Having college credit when you transfer with a GED strengthens your application. However, that does not mean applicants with GEDs cannot apply directly to a four-year college. Many students apply to four-year colleges in Hawaii as first-year undergraduate students with only a GED in lieu of a high school diploma. Colleges prefer a high school diploma and standardized tests such as the SAT and ACT scores, but almost all schools in Hawaii consider online applicants with GEDs. Applicants can submit their GED certificate or GED transcripts along with their application at Hawaii Pacific University, Chaminade University, and the University of Hawaii at Manoa. How many academic terms per year do online colleges in Hawaii offer? Most two- and four-year colleges — including private and public institutions — in Hawaii follow the semester or term schedule. Students start classes, depending on the degree program, two to four times a year. It is rare to find a college based in Hawaii that offers weekly or even monthly start dates. Typically national online colleges, which only offer distance learning, provide students with more start dates throughout the year. Exact start dates for online classes differ, depending on what a student decides to study. Generally, online courses run concurrently with traditional classes held on campus. Ten of the University of Hawaii campuses follow the semester calendar with start dates in the spring, summer, and fall. Online classes at Chaminade University, a private institution, also follow the same schedule as on-campus classes, with four terms beginning in the spring, summer, fall, and winter. Hawaii Pacific University, also a private college, offers online classes with start dates in the spring, summer, fall, and winter. Online universities in Hawaii tend to have cohesive academic calendars for online and on-campus classes with semesters beginning and ending on the same dates. Which online colleges will accept FAFSA in Hawaii? Admissions offices across all regionally accredited campuses in Hawaii accept the FAFSA form. After completing an application, students then fill out a FAFSA form. Every year the Federal Student Aid, an office within the U.S. Department of Education, distributes more than $120 billion in student aid in the form of grants, loans, and work-study programs. Schools, including private and public institutions, and states use the information on the FAFSA to determine how much aid each student receives. Specifically how much each student receives depends on their financial need. Students will add their prospective colleges to the FAFSA and the colleges have access to that information one day after processing the form. To apply for federal aid students must have U.S. citizenship or eligible noncitizenship, a social security number, a GED, or a high school diploma, and they cannot have a federal loan in default. The FAFSA opens every year on October 1st and closes on June 30th. States and colleges may have earlier deadlines. Contact your financial aid office, to get a clear picture of your total cost of college and your expected financial aid. Are there any free online classes I can take from Hawaii colleges? To earn college credit requires time and money. Some students can take advantage of opportunities to take classes through the University of Hawaii system for free. The Senior Citizen Visitor Program/Nā Kūpuna (SCVP/NK) program lets students over the age of 60 take classes at the university, but they cannot receive college credit. Applicants must pass a tuberculosis skin test, a standard protocol for all students, before enrolling in classes. There are programs that offer financial aid to allow eligible students to take college coursework. In most cases, the programs require that students have Hawaii residency to receive aid. For example, the Wai’ale’ale Project provides free classes to residents of Kauai and Niihau. These students can take free classes at Kauai Community College. Other programs such as Early College, Running Start, and Jump Start offer some free community college classes to Hawaii high school students. Those programs run in partnership with the University of Hawaii and the Hawaii Department of Education to provide students with early access to college. How can I find the online program options at Hawaii colleges? Students can access numerous resources to find online college classes in Hawaii. Every search should start at the university or college of a student’s choice. Students will find the most online course options through the University of Hawaii system, which includes 10 campuses across Oahu and the neighbor islands. Distance Learning at the University of Hawaii lists all online classes offered system wide at UH four-year and community colleges. When enrolling, students select one of the UH campuses as their “home” campus, but they can take classes remotely without every visiting the campus. In some cases students may have to take tests at designated UH Test Centers. Otherwise students can do everything online at their leisure. Students can access library resources online through the UH electronic databases. The UH campuses also provide online students with online tutoring services and students can even order school books online. The process of obtaining financial aid begins with completing a FAFSA form. Information submitted on a FAFSA determines if a student meets the low-income requirements to receive Pell Grant aid. If a student qualifies for a Pell Grant, they do not have to repay it. However, not everyone can receive Pell Grant funds, particularly graduate students. For those seeking more aid, scholarships offer a good source. The Allan Sutorik Geiger Revocable Trust offers a $1,000 scholarship through the Hawaii Community Foundation to undergraduate and graduate students who want to study veterinary science. Applicants must have at least a sophomore status and a 3.0 GPA. Students must also demonstrate financial need. The Clem Judd Jr. Memorial Scholarship, distributed through the Hawaii Lodging & Tourism Association, offers two awards to Native Hawaiian undergraduate and graduate students pursuing studies in tourism, hotel administration, or hospitality. Full-time students with a 3.0 GPA and Hawaii residency can apply. Students must apply by June 29. The Hawaii Promise scholarship helps students who have a financial need attend classes at any University of Hawaii community college campus. How much a student receives depends on available funding and a student’s demonstrated financial need, as indicated on their FAFSA application. Applicants must be Hawaii residents enrolled in at least six credits every semester. The 442nd Veterans Scholarship offers funding to full- or part-time students currently pursuing an undergraduate or graduate degree in any area of study. The scholarship, named in honor of the mostly Japanese American combat team which fought in World War II, helps Hawaii high school graduates, who were born in Hawaii. This scholarship helps full-time undergraduate students enrolled in any college in the University of Hawaii system. Applicants need a 3.0 GPA or higher. Students who graduated from a Hawaii high school can receive this scholarship, offered in partnership by the UH Board of Regents, the Board of Trustees of the University of Hawaii Foundation, the President’s Office, and the University of Hawaii Alumni Association.